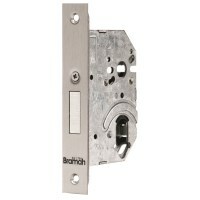 Dual Profile Dead Lock Mortice Case from Bramah and part of their Kaye range of Lock Cases. This dead lock case can be fitted with a Euro or Oval cylinder to operate the locking bolt, this means the lock can be included within an existing keyed alike or master key suite. The lock forend has a steel finish with case depth of 77mm and backset 57mm. The bolt extends 20mm from locks case and the lock case is pierced to accept bolt through furniture such as cylinder security roses.